Motorola with its Moto X smartphone is making improvisations and trying to get maximum sales for the device and has recently announced that you can Lock your Moto X and unlock your device without the help of a Code or pattern but with the help of Tattoo Stickers. Digital Tattoo is a technology which has been developed with the combined effort of VivaLnk Inc. And Google’s advanced technology and projects group, which announced the digital tattoo technology to help unlock your smartphones to make it more safer and personalised to be unlocked only with the help of the tattoo. 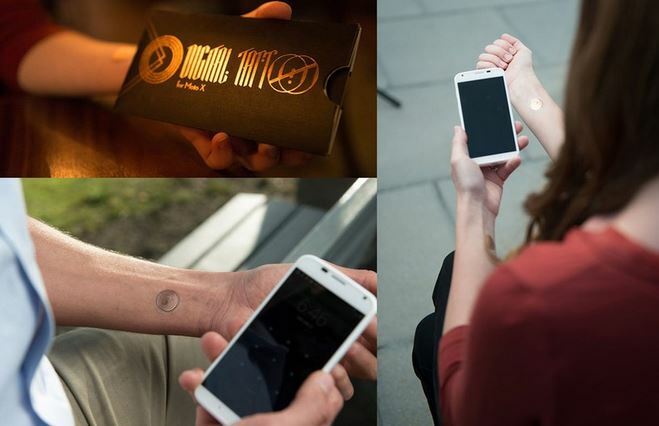 The technology works with the help of a Digital tattoo which is available in VivaLnk’s official website for $9.99 which works with the help of NFC technology. The tattoo is round and nickel sized which has a design on its front side and an adhesive on its back with which it will adhere to your skin without causing any discomfort. VivaLnk says that the adhesive is efficient to last for 5 days and can withstand daily activities like swimming, jogging and showering. But will not withstand scratching and any sharp instruments. Once you have put the tattoo on your palm or wrist, if you want to unlock your device you have to tap on the back of your phone and place your camera on the tattoo which will scan the tattoo and with the help of NFC technology unlock your device. Motorola said this in their blog post about this digital tattoo technology “It’s another step in making it easier to unlock your phone on the go and keep your personal information safe. An average user takes 2.3 seconds to unlock their phone and does this about 39 times a day-a process that some people find so inconvenient that they do not lock their phones at all. Using NFC technology, digital tattoos make it faster to safely unlock your phone anywhere without having to enter a password”. The digital tattoo technology is at present only compatible with Moto X and for Moto X users who are interested in using this Digital Tattoo technology to unlock the device can order it from VivaLnk’s website and stick it to their hands or wrist or hands.